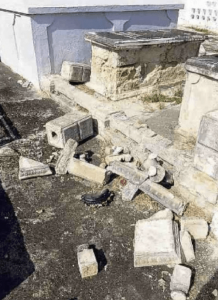 WILLEMSTAD - Several graves at the Protestant Cemetery located at the Julianaplein have been destroyed. Tombs and ornaments such as vases, pots and wreaths were all destroyed. The havoc in the cemetery would have been done weeks ago. A complaint has been filed, but until now it has not produced results. It has not resulted in the arrest of the culprits.